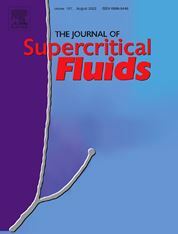 The Journal of Supercritical Fluids is an international journal devoted to the fundamental and applied aspects of supercritical fluids and processes. Its aim is to provide a focused platform for academic and industrial researchers to report their findings and to have ready access to the advances in this rapidly growing field. Its coverage is multidisciplinary and includes both basic and applied topics. Thermodynamics and phase equilibria, reaction kinetics and rate processes, thermal and transport properties, and all topics related to processing such as separations (extraction, fractionation, purification, chromatography) nucleation and impregnation are within the scope. Accounts of specific engineering applications such as those encountered in food, fuel, natural products, minerals, pharmaceuticals and polymer industries are included. Topics related to high pressure equipment design, analytical techniques, sensors, and process control methodologies are also within the scope of the journal. The journal publishes original contributions in all theoretical and experimental aspects of the science and technology of supercritical fluids and processes. Papers that describe novel instrumentation, new experimental methodologies and techniques, predictive procedures and timely review articles are also acceptable. This is a study on the solubility of supercritical carbon dioxide and nitrogen in thermoplastic polyurethane (TPU) and the surface tension of TPU/supercritical fluid interface which are of relevance to foaming of TPU with such physical blowing agents. Results of modeling using the Sanchez-Lacombe equation of state are also presented. Replacing crosslinked polyurethanes that are formed with chemical blowing agents by TPU foamed with a physical blowing agents is of particular interest due to their attractive mechanical and/or thermal insulating properties. This articles reports experimental values for isobaric heat capacity that were measured using a flow calorimeter for carbon dioxide-methanol mixtures in the critical region. Heat capacities were also calculated using Monte Carlo simulations and compared with the experimental values. The findings show that molecular simulations are effective as predictive tool in the experimentally challenging critical region of fluid mixtures. This article reports on the foaming of acrylonitrile-butadiene-styrene (ABS) using sub- or supercritical carbon dioxide as physical blowing agent. To select the foaming conditions, the kinetics of carbon dioxide sorption and equilibrium solubility levels were assessed. Naocellular foams with controlled cell nucleation densities were fabricated. This article describes a supercritical alcohol (isopropanol) route for the uniform anchoring of anatase TiO2 nanoparticles onto surfaces of reduced graphene oxide. The hybrid thus produced is explored as an anode for use in lithium-ion batteries and shown to be a promising anode material for large-scale Li-ion battery applications. This article describes an experimental study and modeling of permeation of high pressure carbon dioxide in perflouroelastomer O-rings used as sealants in high pressure vessels. The study shows two distinct regimes of penetration which are characterized with pressure-dependent, and pressure-independent flux domains. Results are discussed in terms of the solution- diffusion model, and a theoretical model is developed to describe the mass transport of carbon dioxide through the elastomer over different time scales. This study describes surface layering of nanodiamonds on a polymer (for example, polystyrene or poly(methyl methacrylate) microspheres in supercritical carbon dioxide. The study further demonstrates that the thickness of the layered shell can be controlled. The approach provides a general methodology to prepare core-shell microspheres that may be composed of various combinations of other inorganic nanoparticle (for example titanium- or iron oxide) layered shells on a given polymer core.